This week we've been hearing warnings of so-called "sneaker waves" along the coast, which have been known to sweep people and their pets out to sea without warning. These waves are especially sneaky because they can often occur when the weather is perfectly nice. "We don't see a lot of weather during these events," says Larry Smith, a meteorologist at the National Weather Service in Monterey. "And that kind of feeds into the 'sneaker wave' thing." But the presence of sneaker waves means that the weather is bad somewhere. These sneakers are the remnants of Typhoon Wipha, which shredded its way along the coast of Japan last week, before heading toward the Aleutian Islands. We're catching them at the end of a 2,000-mile journey, across what scientists call the "fetch zone." "The winds within that fetch zone were between 50 and 60 knots, I believe," Smith explains. (That translates to winds speeds of 57 to 69 miles an hour.) "So those winds over those waves continually build the ocean up." But while size matters, a sneaker's danger is compounded by the speed it's moving when it hits the shore. "A lot of times these waves may only be 4-6 feet in the open sea," says Smith. "But they're moving at a much higher velocity than we usually see on the coast." Meteorologists measure the velocity of a moving wave by the "period," the distance from the bottom of the trough on one side of the wave to the bottom of the trough on the other side. Smith and his colleague, Warren Blier, got their pencils out for us and calculated that in open waters, where the wave is seeing little-to-no friction, a 5-foot-high wave with a period of 20 seconds will be traveling at a highway speed of around 70 mph, easily twice as fast as the more typical waves we see along the coast. It's not uncommon for sneaker waves to have periods of 20 seconds or more. "When the waves begin to feel the beach bottom they will begin to slow down substantially," says Smith. So that wave with the 20-second period will hit a typical beach at something like the speed of a running adult. Unfortunately, many of our beaches aren't typical. "The catch is that along our coast we have many steep beaches that don't slow the fast-moving wave down," says Smith, citing as examples Monastery and Carmel River Beaches, located just south of Carmel. 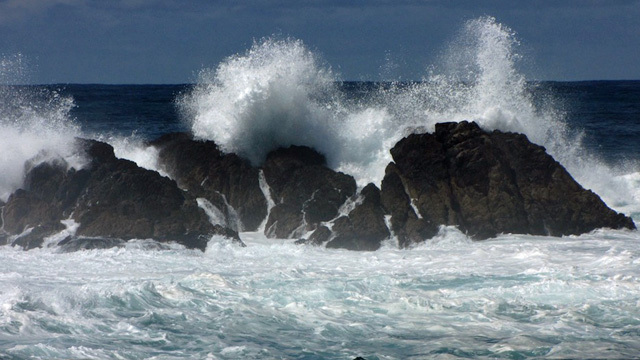 Though the terms "sneaker" and "rogue" wave are often used interchangeably in media reports, Smith considers a "rogue wave" a different phenomenon, one that occurs out at sea, as a result of wave interactions. Rogue or sneaker, one certainly caught spectators off guard as they were watching the Mavericks surf competition in 2010 (see video). Smith says this particular event is subsiding now, so far without any reported tragic incidents along the Bay Area coast.